A rocket launch initially scheduled for yesterday afternoon is set to possibly launch from Wallops Island, VA, on Friday afternoon, providing Shore residents and folks with a solid south and southeast horizon view a glimpse of this rocket as it launches into the sky. As of this last night, any Friday launch would be scheduled for around 5 PM. The Antares rocket, which will provide cargo to the International Space Station, is the largest rocket to be launched from the Virginia facility, located on the Delmarva Peninsula's Atlantic coastline. It was initially scheduled to launch yesterday but that was postponed due to a technical glitch with the rocket. Assuming the rocket launches on Friday afternoon, it will provide folks at the Shore and those with a solid southeast and south horizon view something we don't see too often around here. The best view spots will be at the Shore (unobstructed ocean view) or along any ridge top in Southeast Pennsylvania that provides a clear view to the south and southeast. The rocket will be visible about a minute to 90 seconds after liftoff and will progress across the southeast sky as it works its way up into space. 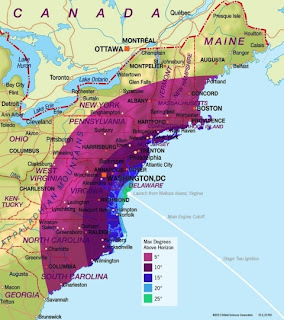 Orbital.com provides a number of graphics that show the projected path of the rocket after launch for a number of locations, mainly around the DC area...but also for Atlantic City and New York City, which should have a decent view of the launch. Friday's launch, like any rocket launch, is weather dependent but odds favor weather being dry enough to allow for the launch in the afternoon; however, low clouds along the coast may loom a possible hindrance for any launch on Friday should those move or linger inland.